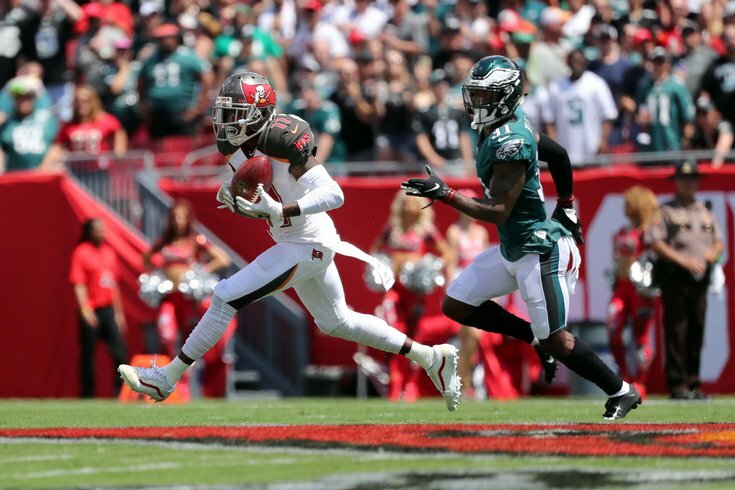 In the Philadelphia Eagles' loss to the Tampa Bay Buccaneers on Sunday, cornerback Jalen Mills was bad. #Analysis. By my count, he gave up 8 receptions on 8 targets for a buttload of yards and a couple scores. There were 0 wags of the finger. Before we show all 8 targets, it's fair to note that Mills had an incredibly difficult job on Sunday. On any given play, he was facing off against DeSean Jackson, Mike Evans, or Chris Godwin. Jackson is arguably the most prolific deep threat in NFL history, Evans is a 6'5 monster who has topped 1000 yards in each of his first four years in the NFL, and Godwin is a very good, up-and-coming receiver. All three players are different sizes and shapes with varying skill sets, and Mills was asked to man up on each of them. As you saw, it did not go well. Here were all 8 of Mills' targets on Sunday. Meanwhile, second-year corner Sidney Jones was a rare bright spot for the Eagles' secondary, as ProFootballFocus rated him as the best slot corner in the league Week 2. What they're saying about Eagles: How much should we expect from Carson Wentz? Surprisingly, Week 2 did not have a single interception on defense from the slot cornerback position. In coverage from the slot, Jones’ 60.4 passer rating when targeted led the NFL’s qualified cornerbacks with at least 10 snaps from the position. By my count, Jones was targeted once on Sunday, an incompletion to slot receiver Adam Humphries, so I'm not sure what the sense is in posting a passer rating for him (which is wrong by the way, as it should be 39.4, but whatever). When Jones was in man coverage, he was almost always tasked with covering Humphries, which is a hell of a lot easier than covering the trio of Jackson, Evans, and Godwin. Jones did have tight coverage all day, as Humphries mostly failed to gain separation from Jones even when the ball went elsewhere. Still, Mills' bad performance, coupled with Jones' positive performance, has led observers to wonder if Jones should be starting on the outside, with Mills perhaps having a somewhat smaller role as the slot corner. That's certainly fair to consider, however, comparing Jones' assignments to Mills' is like comparing apples to watermelons. At some point though, if Mills doesn't play better, the calls for that switch are rightfully going to get louder.